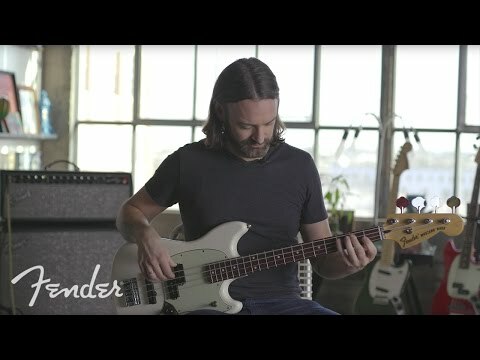 The Mustang Bass is one of Fender's long-established models, created in 1964, and has been used by a wide range of famous musicians from Tina Weymouth of Talking Heads to Mikey Way from My Chemical Romance. Hailing from the Mexican-built Fender Offset series, the Mustang Bass PJ features a range of superb upgraded appointments that make this modern bass ready for the stage. A prominent feature of the Mustang Bass is its short-scale body and unique shape. The short-scale design adds power while also ensuring a comfortable playing feel. The solid body is constructed from alder and given a protective gloss polyester layer. The Mustang Bass is fitted with a "C" shape maple neck which has a satin polyurethane finish for a comfortable playing feel. Topping the neck is a slick, 9.5 inch radius pau ferro fingerboard with 19 medium jumbo frets ready to explore. The fingerboard is decorated with white dot inlays to guide you from one fret to the next. Furthermore, due to the shorter scale size of the bass, the string tension is reduced which will enhance any sort of bass-playing style. The 2016 Mustang Bass is kitted out with two superb single-coil pickups; a vintage-style Jazz Bass pickup in the bridge accompanied by a split single-coil Precision Bass pickup in the middle. By employing each of these pickups it provides the best of both worlds of sound, thus offering unrivalled versatility for any bassist. This is an ideal pickup pairing that adds weight and power to the low notes but also gives the high notes an added sweetness. The Mustang Bass PJ features very simple controls for Master Volume and Tone, joined by a 3-way toggle pickup switch to mold your desired sound output. The headstock is fitted with Fender Vintage-Style tuning machines that maintain incredible tuning accuracy for each string. A 4-saddle high-mass vintage bridge is fitted to the PJ Bass which offers great sustain and rich tones. The stunning gloss finish of the body features a 4-ply aged white pearloid pickguard while the nickel hardware and black plastic Jazz Bass buttons further complement the colour.